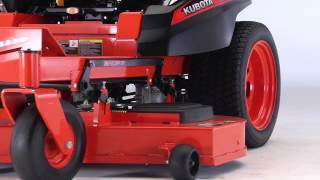 Kubota Z100 Series - Model Landing - Camrose Dynamic Sales & Service Inc. Comfort, ease and a whole lot of style. The Kommander was designed to make the grass look greener on your side of the fence. All that power from the engine is delivered to the wheels and mower deck through a rugged, Hydro- Gear commercial ZT3100 transmission. This 10 gauge steel, welded mower deck provides outstanding, professional level cutting performance. If you're a homeowner who wants the best-this mower deck is for you. The seat slides a full 6" forward and back, letting you find just the right position for maximum personal comfort. Soft and roomy, the high back will keep you comfortable even on those extra-long mowing jobs. There's plenty of storage for cell phone, drink cup or tumbler and so on. Standard on the S-model and optional on the E-model, the bright LED headlight lets you continue mowing in low light conditions.